October 15-19 the Working Group on transnational corporations and other business enterprises with respect to human rights debated on the zero draft legally binding international instrument regulating transnational enterprises activities. It is a burning topic, because if the proposed international instrument is adopted it would oblige states to respect human rights in business transnational activities. 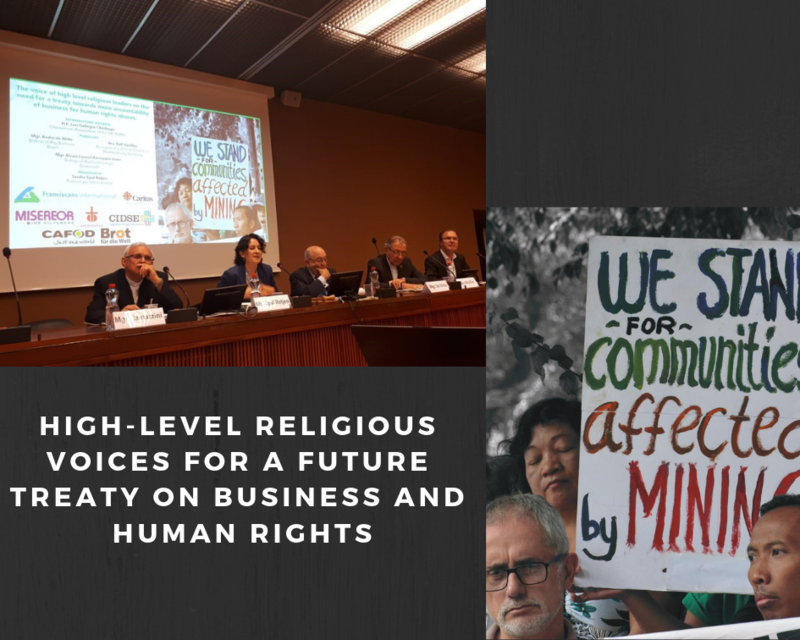 On Wednesday the 17th, a group of faith-based NGOs organised a side event titled “High-level religious voices for a future treaty”. Franciscan International, Caritas Internationalis, Misereor, CIDSE, CAFOD, Fastenopfer and Brot für die Welt convened to integrate the religious point of view on the existing dialogue happening within the Working Group. Despite the short time available, interventions made by panelists were very rich and I would like to share some considerations on the meeting. When panelists started to speak, I felt transported to Ecuador, Guatemala and Brasil, among victims of violence and injustice. I feel I do not have the right to engage on this topic, firstly having never crossed the Atlantic Ocean. Secondly, being European; a member of the world that has favoured its own interests for centuries, at the expense of South America. Luis Gallegos Chiriboga is the first speaker: he is the Ecuadorian ambassador and the chairman of the Working Group involved in the session. He supports a very unpopular cause among diplomats, standing by victims. He even dares talking about the moral reason behind his engagement, thus shaking up the paradigm according to which “the wallet is more valuable than human rights”. I picture him as a South American Don Quixote, yet there is a relevant difference between him and his Iberian colleague: he knows he is fighting against windmills, a seemingly impossible task, but his recognition of this challenge helps him in choosing more suitable arms. I remember noticing on the OHCHR website that next Working Group session programme is already posted, and it follows the same agenda as the current one. Then, why should delegations meet if they already know they will have to start over next year? I am sceptical, but Gallegos surprises me in confessing he is optimist: sooner or later the treaty will be accepted and victims will smile again. The second speaker is Álvaro Leonel Ramazzini Imeri, bishop of Huehuetenango, Guatemala. He points out several chronic problems affecting his country: inequality, exploitation, persecution of human rights defenders, and armed conflict. When analysing causes of such issues, he refers to excluding macroeconomic policies, inexorable migration flow and indifference towards indigenous groups who are repeatedly deprived of their material goods (NB, “material goods” and not “resources”, to avoid a profit-mentality). Guatemala has been living violence since 1957 and I would expect a cautious and resigned man, but what I see instead is a person who does not bow down to anything and voices criticism: towards the government and hydroelectric companies, towards neoliberal economics and the Guatemalan administration. I am fascinated by this man, but at the same time he eludes my full understanding: he describes communities and the environment as if he was talking about his own family, but I would like to know more, to get to know more. “The Gospel is not diplomatic: you cannot serve both God and money! There is not worse fight than the one that is not fought, and if you do not fight/give up you are an accomplice. I want to weigh in on your conscience, because mine is already weighed”. I can only listen and take note, how powerful! Later, Rev. Ralf Häußler, representative of the Evangelical-Lutheran Church takes the floor. His intervention seems to be quieter than the other ones, because it is the fruit of German rational analysis more than South American passion. The main point of his speech is the necessity of working to feed and strengthen multilateralism. Moreover, he repeatedly makes reference to the draft treaty and the steps undertaken by the German government and the European Union. I appreciate his consistent position and share the idea that I should not feel guilty for being part of the “developed world”, it is more useful to understand my environment and internally push towards a change. I feel close to his ways of interpreting reality and think about a real European identity, far from propaganda and hypocrisy, but founded on shared history and values. The last speaker is André de Witte, bishop of Ruy Barbosa, Brazil. He claims missionary life is made up of two elements, necessarily intertwined: maintaining a Catholic identity and creating an equal society so that everyone can live in dignity. “Land, Roof e Work”, these are the needs of indigenous communities. He is not telling stories he heard, but facts he experienced and shared with Amazon people. To him, this is about “being at the service of life” and I find his words are tremendously true. On the way home, I keep thinking about the side event and I feel something I cannot clearly identify is lacking: what is the role of the Church in such contexts? I feel like I have met exceptional men, who are putting into practice “Laudato Si’” daily and they are showing the best version of the Church. A Church that does not sit among the powerful, but stands by poor and vulnerable people by principle. At the same time, I felt there was something unsaid: how can bishops complement service to poor people with institutional advocacy? Finding a balance is necessary. I cannot find an answer, but I think this is the only possible way not to betray the Gospel and be a credible Church.